Our goals track with what are common characteristics of many of the heritage breeds: tough, hardy animals that are capable of thriving on pasture or forage; disease and parasite resistant; friendly and gentle; multi-purpose; and are easy breeders with good mothering instinct. 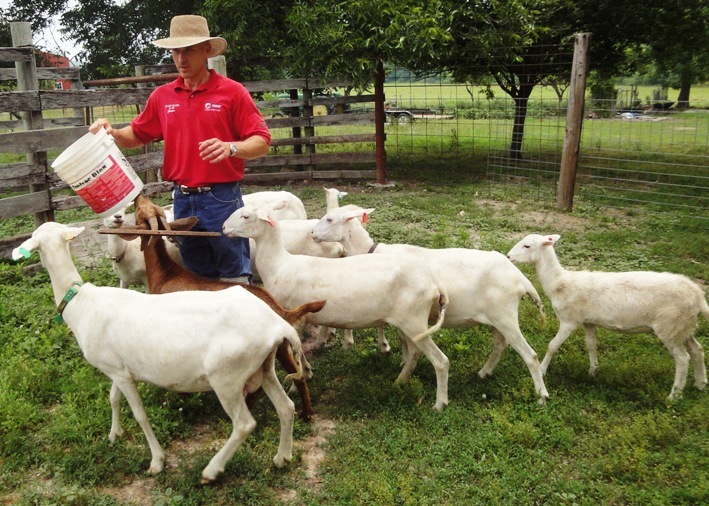 We look for relatively low maintenance requirements and size and disposition that are easily worked by Soldiers who may be new to livestock and in some cases may be recovering from wounds. After doing research on various sheep breeds we became enamored with St Croix after seeing them in a herd dog exhibition near St Augustine, Florida and visiting Stauber Farm in western North Carolina. St Croix have all the qualifications we are seeking: they are friendly but hardy, prolific breeders, and multi-taskers, providing both meat and milk. For us an added bonus is that St Croix are hair sheep, meaning that they shed their winter coats when the weather warms, obviating the need for annual shearing. Since Five Ponds is still growing their herd, Erik and Marian are holding onto their ewes until they reach the numbers that track with their goal. We enjoyed walking among their sheep and look forward to the day that they are ready to offer some for purchase. A real treat was getting out to see the Dexter cattle. 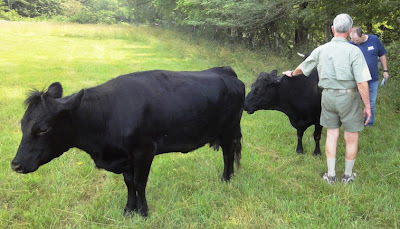 These hardy cattle are naturally smaller than what you typically see on pasture. Mature Dexters are about half the size of the more common breeds. Originally from the UK they were selected over generations to be more manageable for a small landholder. They are quite capable of making a living on grazing and calf easily. Dexters are multi-purpose: they give milk, meat, and make nice oxen. We found them to be very calm and relaxed around people. Dexters come in three colors, red, tan, and black, the latter being predominant. Some are born polled (no horns) though most have horns. We were happy to learn that Erik and Marian will have calves later in the year and that some will be available for purchase, so we hope to be able to put them on the Valhalla pastures before too long. When we visited Persimmon Creek, about 15 miles away from Five Ponds, we found that Jason and Miranda have a much larger herd of St Croix and have stock available most of the year. That's good news for us as we are eager to have the sheep begin to work the pastures along with cattle. We have become a real proponent of multi-species rotational grazing (click here for my post on rotational grazing) and this would give us an opportunity to devleop management procedures from the start. One of the unusual practices at Persimmon Creek is that they use their St Croix as milk producers. Although not typically known as "milk sheep" the St Croix produce prodigious quantities of milk and are very capable of supporting lambs while being milked daily. Jason and Miranda are selectively breeding for milk production and currently use their milk for drinking and to make butter. They report that it is much sweeter than cow or goat milk. Since some of the most popular cheeses are sheep-based the opportunity for expanding into that area are there, too as well as yogurt and other milk products. We look forward to working with both farms to begin the livestock establishment program on Valhalla, we hope sooner rather than later.